History - In order to prevent scurvy during the 1800s, British sailors were issued a daily allowance of citrus such as lime (presumably Citrus × aurantifolia), giving them the nickname Limey. It was later discovered that this beneficial effect derived from the quantities of vitamin C the fruit contain. 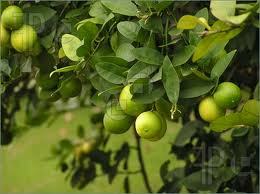 Lime extracts and essential oils are frequently used in perfumes, cleansing products, and for aromatherapy. Effects on the Mind - The fresh fragrance of Lime is uplifting and energizing as well as stimulating to the mind. Effects on the Body - Lime is antibacterial, antifungal, antiseptic, and stimulating. Blends Well With - Lime blends well with Bergamot, Cedarwood, Geranium, Grapefruit, Lavender, Lemon, Mandarin, Neroli, Orange, Rosemary, Vetiver and Ylang Ylang. Cautions - DO NOT apply this oil directly to the skin without being diluted in a carrier oil first. Do not use prior to going out in the Sun. I like lime as an alternative to lemon in some of my oil blends. Gives a deeper, more invigorating aroma.